It’s hard to imagine what legal logic the Oklahoma Supreme Court could use to rule the recently passed tax-cut bill does not violate the constitutional requirement that state legislation only contain one subject. If the court does rule the bill is valid, then it will set a precedent that will render the single subject constitutional requirement pretty much a political football in the future. Whether that’s good or bad depends on your views of logrolling. 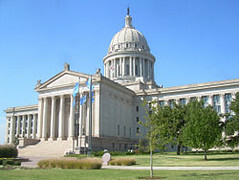 Oklahoma City attorney Jerry Fent, a local activist, has filed a lawsuit with the court challenging the legality of House Bill 2032, passed last legislative session and signed by Gov. Mary Fallin. The bill drops the top income tax rate from 5.25 percent to 5 percent starting in 2015 and then to 4.85 percent in 2016 depending on revenue growth. Here’s the catch: The bill also includes an appropriation of $120 million to repair the state Capitol building. The two items have nothing to do with one another. The specificity of the repair money is extremely problematic. The fact that the tax cut reduces state revenue and the appropriation spends money also makes Fent’s case even stronger. The two subjects are not only specifically unrelated they are also polar opposites. If, for example, the bill was a tax hike to specifically raise money for repairs, then it might make some sense. State laws preventing more than one subject in a bill are aimed at preventing a technique known as logrolling in which legislators place extra items in legislation to gain broad support. In Washington, that usually translates into diverse and sometimes unusual spending bills that cater to a variety of politicians and their constituents. Some argue the practice circumvents the democratic process and leads to wasteful spending; others argue it’s just part of the give and take process in a democracy. Fallin and fellow Republicans are hoping the court rules in the broader sense that the bill is simply about taxation and appropriation, but they had to know they were taking a gamble. I’ve argued that Republicans might have intentionally taken this gamble, knowing they could pass another tax cut next session or not. This way they can boast they passed a tax cut without actually doing so. Speaking in favor of the measure on the House floor last session, state Rep. Scott Martin, a Norman Republican, argued the bill does “two fantastic things.” What other evidence do you need? The bottom line behind all the legal and political maneuvering is that the state can’t afford a tax cut because of recent cuts in education over the last few years. The $120 million for repairs to the crumbling state Capitol building is desperately needed, for sure, but that money should have come from a bond issue or it should have been appropriated in a separate bill, which might not have passed. The court recently invalidated a 2009 tort “reform” law because it violated the single subject law so it appears it might take a more narrow view of the constitutional requirement than what Republicans here might hope.